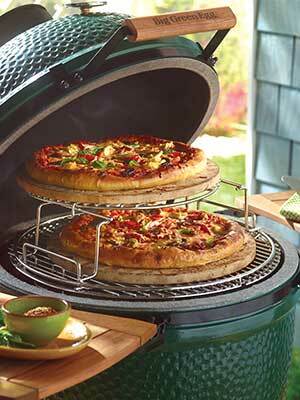 Versatility is what a Big Green Egg is known for! Here is a sampling of what the Big Green Egg – the best ceramic kamado style charcoal grill and smoker on the market – can accomplish! Versatility is what a Big Green Egg is known for! The EGG offers unparalleled cooking experiences, and you’ll soon discover how easy and fun it is to create a variety of dishes or an entire meal in your EGG. Here is a sampling of what you can accomplish using the best cooking techniques. When grilling direct, food is placed over the fire and cooked by direct exposure to the flame and heat. 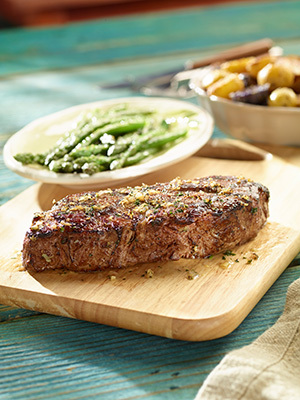 It’s the ideal way to cook steaks, chops, burgers, boneless chicken breasts, kabobs, fish fillets, many vegetables and other quick-cooking foods. And with a Stir-Fry & Paella Pan in place directly over the hot fire, you can make a tasty stir-fry in just minutes! Generally, foods that are tender, less than two inches thick and boneless are good candidates for direct grilling. Direct grilling sears the exterior surface of the meat to form a delicious crust with the juices locked inside. Because of the ingenious design of the EGG and the fact that grilling is always done with the lid closed, flare-ups and hot spots are virtually eliminated. For some foods, you will want to start out searing over high temperatures and then reduce the heat by adjusting the dampers to finish cooking. With indirect grilling and roasting, the food is not directly exposed to flame and heat, as a convEGGtor or Drip Pan is placed beneath the food to deflect the heat. Food is cooked by the convection process which radiates surrounding heat from the coals, side walls and dome of the EGG … there’s no need for a separate rotisserie device because meats are naturally juicier when slow roasted in the EGG. Our vertical roasters work just like the original Greek rotisseries to allow the fat and drippings to collect in the pan, and will produce delicious, crisp meats and poultry without the need to add a device to rotate the food constantly. 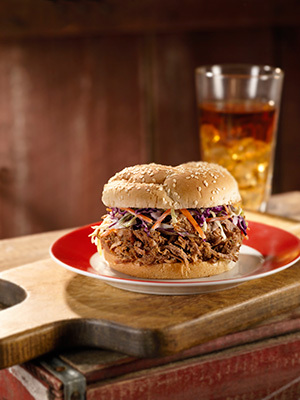 Cooking slowly over low heat infused with wood smoke is what smoking – and what some call “real barbecue” – is all about. Cooking “low and slow” breaks down connective tissue and tenderizes tough (and typically less expensive) cuts of meat like beef brisket, pork shoulder and spare ribs. For smoking these kinds of foods, cooking times are measured in hours rather than minutes – and it is well worth the time! The result is succulent, fall-off-the-bone tenderness with the tangy, complex combination of spices, smoke and natural meat flavors. Of course, you can also smoke other types of foods that may not fit the usual profile. Fish, turkey, nuts, vegetables, and even cheeses do not need to be tenderized with slow cooking, but they taste even better when kissed with the essence of wood smoke over low heat. Suggested smoking temperatures range from 225°F/107°C to 275°F/135°C. The design of the EGG makes it easy to adjust the draft openings to set the proper temperature for ‘low and slow’. But unlike a pitmaster, who must work constantly to maintain those low temperatures throughout an extended smoking period, an EGG can retain heat at precise temperatures for many hours of cooking with little attention required. A convEGGtor is particularly useful when smoking because it adds a barrier between the food and the direct heat of the fire, but also allows the hot air and smoke to circulate around the food. And the convection effect eliminates the need to constantly turn food during smoking or low-temp cooking. With the addition of a convEGGtor and a Pizza & Baking Stone, your ceramic cooker becomes a classic brick oven that bakes fantastic pizzas, breads, biscuits, pies, calzones, cobblers and cookies! The combination of precise temperature control and heat retention, with the properties of the ceramics in the EGG itself and the Pizza & Baking Stone, create the perfect environment for baking. As your pizza cooks, moisture is drawn to the Stone for an authentic, crispy, brick-oven-style crust that is impossible to re-create in an indoor oven or on an ordinary barbecue grill.